Here is the video I did for the lovely girls of Pi Beta Phi at the University of Florida! They are a great group of girls and great to work with when it comes to filming. They are super fun and know how to have a good time! Really enjoyed making this video. Check it out and let me know what you think. This is first of three recruitment video trailers I have done this summer! 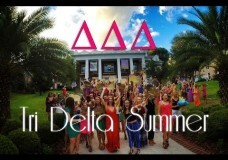 This one is for the lovely ladies of Delta Delta Delta. Its great working with them and a treat to be able to provide such great coverage of their summer for the girls to see!